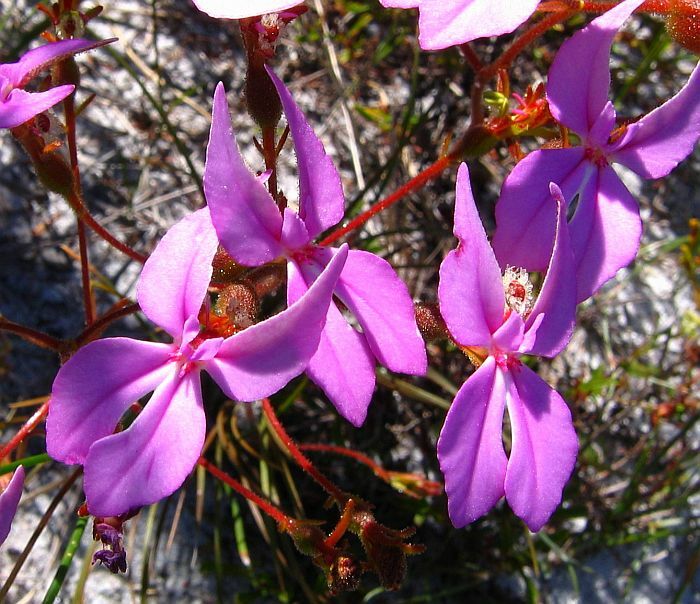 There are around 250 described Western Australian Stylidium species (also known as Trigger Plants), which is considerably more than anywhere else, plus there are others yet to be studied. 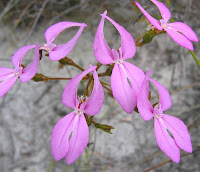 Their family Stylidiaceae includes other genera and occur in New Zealand, Southeast Asia and South America, but in total their species number fall well short of the southern WA tally. 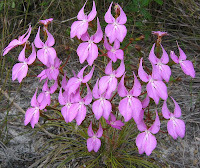 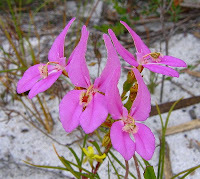 Stylidium species have evolved a highly specialised method of ensuring cross fertilisation, although a similar concept is employed by some orchids, where a pollinating wasp is catapulted by the labellum (which mimics the female wasp) into the column where pollen is either attached to the wasp, or deposited from the wasp onto the style. With Stylidium the column (which combines the stamen and style) is the moving part and is triggered by an insect inspecting the central part of the flower. The spring released column then rapidly arcs between a pair of petals to deposit pollen on the insects back, or if the insect has visited another flower, to pick-up the transported pollen and so cross fertilise the flower. 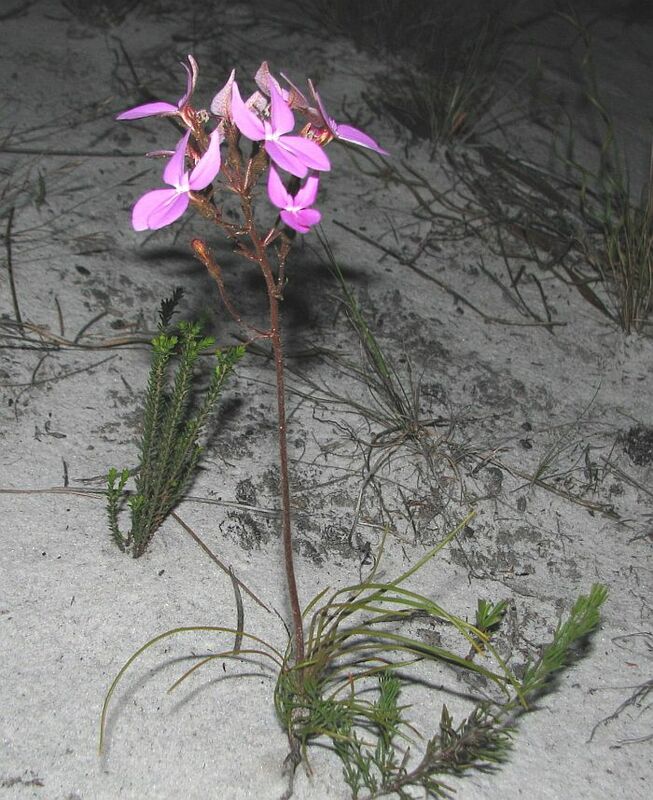 The triggered column can reset itself in preparation of other visiting insects, but this can take several hours. Stylidium macranthum (also known as Crab Claws) would be one of the most spectacular of the local species, with large (2.5 cm or 1” in length) bright pink flowers on long (around 30 cm or 12”) stems, which are surrounded at their base by lax soft arching green leaves. 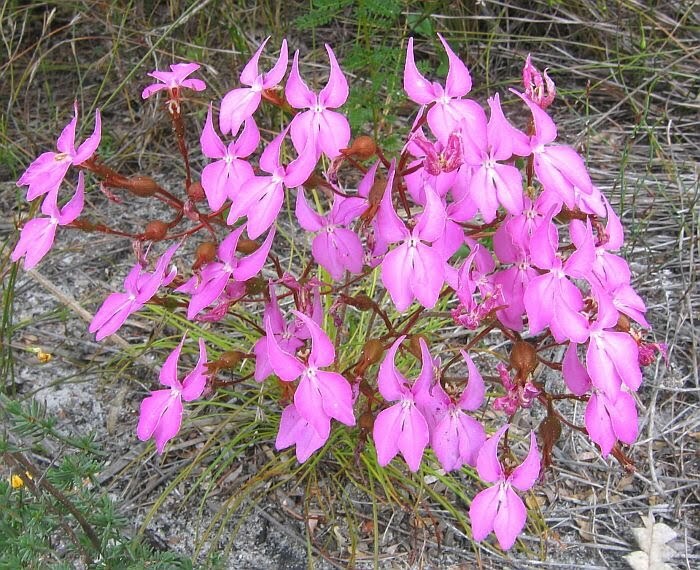 Esperance is pretty much at the centre of this plants distribution, from Ravensthorpe in the west to Israelite Bay in the east (320 km or 200 miles overall distance). It extends inland to the mallee region where it can be found on sandy rises and around granite outcrops. 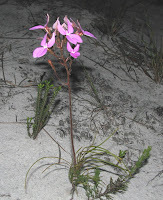 Nearer the coast it is common on non-calcareous sands (typically heathland), or sand over gravel, granite or limestone (with the latter, the overlying sands are leeched of calcareous material and are not alkaline). Flowering is from September to November.